After a “healthy” lunch of quesadillas, I ran into the office to start playing my favorite video game, Age of Mythology. “Only play for thirty minutes!” my mom yelled from across the house. “Okay!” I yelled back. Looking back, I can see that I definitely didn’t play for just thirty minutes. I clicked the Zeus icon on my computer and Age of Mythology popped up. I clicked like a billion times before the videos at the beginning of the game stopped. It loaded and I clicked on single player and random map. Instead of the normal screen popping up that lets you choose what god you want, the screen filled with colors that started swirling to the center, then the computer hummed and beeped. This was not normal. I turned around. The world started spinning. “A-a-a-h!” I yelled. And everything went black. We talked about how the I can see that I definitely didn’t play for just thirty minutes line is a form of foreshadowing. He knows what that term means from discussions we’ve had about audiobooks we’ve listened to together. I told T that I thought his line was a subtle, effective way to intrigue his readers. When I came to, I was lying in a field of grass. I looked around. There were some trees—oak, I thought—and some deer stood around grazing. I got up and turned around and saw a mound of shining rock. Wait, not rock—gold! I ran to the gold and picked up handfuls of it. For the first time, questions started popping into my head. Where was I? How did I get here? And where the heck was my computer?!? Suddenly I started hearing voices. People! I ran to where the voices were coming from. I tripped on a twig, and toppled down a steep hill. I hit my head at the bottom. “Ow!” I put my hand up and rubbed the sore spot. I was in another valley and this time there were two armed ranks of soldiers charging at me! Wait, not me—at each other! As we transcribed these lines, I showed T how I’d used a dash in a few places, to translate his spoken lines properly. I wanted to make sure he was okay with the dashes, and I wanted him to understand why I’d used them. By the Wait, not me—at each other! line, T was suggesting I use a dash. Pretty good for a nine-year-old! He also encouraged me to italicize my computer for emphasis. Kids really can pick up a lot of grammar painlessly through dictation. They see punctuation as a useful tool–not as some pointless skill to memorize. I scrambled up the hill and looked down on them. These guys weren’t like normal soldiers. They didn’t wear camo and have guns. They had weapons like you see in medieval museums: spears, swords, hammers, axes, shields etc. But they were different from each other. One side looked more heavily-armed, with gleaming armor. They also had swords, spears and shields. Weirdest of all, on their heads were Greek helmets, with the horsehair crest and all. On the other side were guys that looked more like barbarians. They had clubs, axes and hammers. Hardly any of them had swords. Their armor was animal skins and some of them were even bare-backed. They looked like cavemen. Each side also had its own horsemen and the guys that looked like Greeks even had archers. They clashed together! I focused on two guys. The Greek guy had a spear and a shield, and the caveman dude had a giant hammer. The spearman stabbed the guy with the hammer, but instead of dropping down dead, the hammer-man just accepted the blow! He pounded the other guy in the head, but the spearman didn’t seem to notice. Either these guys were all medieval supermen, or this was one of those renaissance fairs, and these were all rubber weapons. And here we have the inevitable video game violence. Although the violence was rather humorous in its ineffectiveness–and that humor was intentional on T’s part. I have to wonder, if he were in a classroom, would he be allowed to write this? If not, I think that would be a real shame; the violence isn’t the focus of this piece, and there’s all sorts of other good, literate stuff going on here. I admit that if T wanted to dictate graphically violent material, I’d tell him that I’d prefer not to write it. That’s any transcriber’s right, I think. There have been times when I’ve asked him to tone down the violence in a piece he planned to read at our writer’s workshop. So he did. It wasn’t an issue for him. After a short battle, the hammer-man hit the spearman, and the spearman dropped to the ground. The hammer-man roared and charged forward. Another Greek guy came out to meet him. He had a short shield and sword and he seemed to glow. He stabbed the hammer-man and the hammer-man toppled down. I looked at the battle unfolding. “Retreat!” yelled another guy with a hammer, and the cavemen ran over a hill. The Greeks chased them. They came back shortly after, and it looked like they’d lost half their number. The guy with the sword saw me, and he beckoned me down. I warily crept down the hill, holding a stick that I found, even though I figured it wouldn’t do much against those spears. The guy with the sword spoke something to me in a strange language. “I do not believe we have met,” he replied. Suddenly a horn blast split through the afternoon light. T read this to the kids in our writer’s workshop, and it was fun to get feedback both from kids who play Age of Mythology and kids who don’t. As he’d dictated it, I’d reminded him that he might want to keep both types of reader in mind as he narrated. Even the kids who don’t play the game understood that T’s character (himself, naturally!) had been sucked into a video game. They understood that characters didn’t immediately die after being struck with swords because they were video game characters. They didn’t know that the glowing character was a hero, as the game-playing kids did, but they knew he was important. I thought T did a nice job of balancing the story for both audiences. And the kids gave him lots of enthusiastic feedback, and encouraged him to keep writing it. 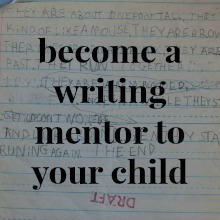 Which brings us back to one of my essential beliefs about writing with kids: Let them write about their passions. Don’t worry so much that they’re writing about topics that you approve of; don’t worry that they’re working in a variety of genres. Writing textbooks want to convince you that kids need to write in a bunch of prescribed formats–persuasive, informational, fictional narrative, personal narrative… Persuasive, schmersuasive! 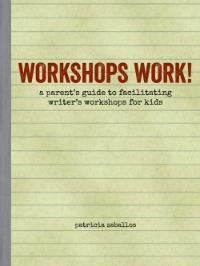 Help your kids find formats that they enjoy, and they’ll learn to think like writers. That’s what matters. If they can do that, they’ll be able to tackle any of those other formats when a real reason comes along for them to do so. –Barry Lane, But How Do You Teach Writing? Help your kids find the stories that they want to tell. Even if they aren’t stories, per se. Even if their inspiration comes from a video game. I loved Mr. T’s sarcastic beginning and I cracked up when I read: “Either these guys were all medieval supermen, or this was one of those renaissance fairs”. T. has a great sense of humour. His story is like a modern twist on A Connecticut Yankee in King Arthur’s Court. Funny, as I was reading your post my oldest is narrating a story to youngest about a rock band called “Minus Safety”. Minus Safety? Ha! One of our family’s favorite driving games is making up band names. Minus Safety is awesome. Dude. WOW!! double wow!! 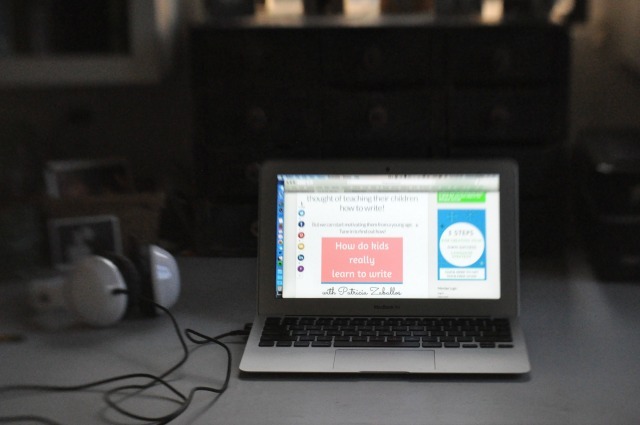 I loved the story–I’m on the edge of the tiny stool that sits in front of our computer because my kid is using the desk chari, adn I WANT TO KNOW WHAT HAPPENS, dammit!! I have been so. very. inspired and motivated by your assertion that dictation is as good as the “real” thing and find that my seven-year-old responds so well. A note about this violence thing: I don’t have boys, (full disclaimer), but I think we do our male children a sad disservice when we try to reason out their naturally-occuring agression. I mean, isn’t that what testosterone is? So I don’t actually find his violence at all disturbing, since physical violence in story often is an appropriate metaphor for life. We certainly all churn and burn internally–why wouldn’t story about that help to put words to our human story? Just a thought. As usual, Patricia, you’re my own personal rock star idol. I sort of wish I could just channel your phenomenally brilliant juju. About boys–yes. I agree totally. And kudos for you for realizing that, even though you live in a gaggle of girls! Oh boy, I love your kid! Brilliant – not just the story in itself but the details, the literary details! My girl writes re-workings of favourite books (well, the opening pages of favourite books) and seems to have the same instinct as your T for the literary form. Now she’s very into adressing the reader with puns and wordplay, it’s awesome. She gets bored of the story preety soon, though, so she’s really trying out different styles rather than a whole structured narrative. She’ll ne nine on Sunday. My younger boy is very into details while narrating his adventures – this evening he has spent about half an hour describing the walkie talkies his friend brough to school today. He even described the texture of the knobs!!!! Re: violence. With two boys, its unavoidable. Their way to relax is to have amicable fights on the couch and all over the floor… Then the younger one will tell in very fine detail how the fist of the older one just missed his second-from-the-right-eyelash… and the older one, instead of using all those words, will re-enact the fight in very slow motion for me to appreciate it. Marta, I’m glad you see that talking is really the first step into writing. Just getting our kids to talk about what they’re interested in is such an important way to help them develop into writers. I’m not sure whether every person is a narrator, but I do know that it’s human nature to be interested in story. That doesn’t necessarily mean that we’re all storytellers, but we all respond to a good story. Some kids enjoy writing fiction; some kids are more comfortable in nonfiction. But even for the nonfiction writers, it’s important to understand the way story works, in order to write material that’s interesting. For instance, I generally write nonfiction in the form of personal essays, but I still try to use the tools of a fiction writer to make my readers want to keep reading. I play with suspense; I try to use compelling dialogue; I strive to make real people seem complicated and vivid, and so on. That’s what Barry Lane meant in the quote I shared above: no matter what the genre (even nonfiction), good writing has a story to tell, and that’s what makes us want to keep reading. Just take a look at any good documentary film. 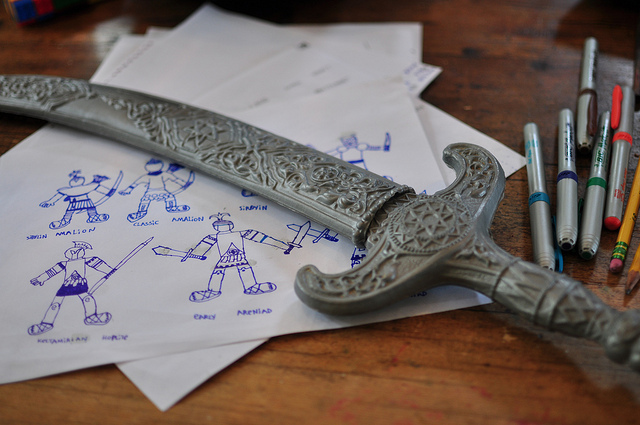 Or, considering your son’s interest in Percy Jackson, what might nonfiction writing about a fictional character look like? The ultimate guide post might have some ideas for a kid who is imaginative, but who doesn’t want to tell a story. I suppose what you’re asking me is whether everyone has a story to tell. And I would say yes! For some of us it just might be harder to figure out what that story is. So, let me re-phrase it: do all children really have the ability/need/willingness to express themselves with words? And, if so, how can we foster the ability if there is no willingness (and even if it’s only us who feel the need for them to express themselves verbally…)? Ah, I’m sorry I misunderstood you, Marta. I’m thinking that maybe you’ve answered this question yourself. 🙂 I think that some kids are more inclined to express themselves verbally, and some kids are less inclined to do so. It seems that your oldest is not drawn to verbal expression the same way your younger two are. And of course that’s fine; we all have different strengths. But I have discovered some interesting research lately for an article I’m writing. This research is all about how writing is becoming more important than it’s ever been before. We’re writing more than we ever have, and writing is becoming a daily requirement for more and more jobs. It’s an increasingly important skill to develop, even for people who aren’t as motivated toward verbal expression. It seems to me that the best way to encourage your son is to talk to him about what interests him–and it sounds like you’ve already figured this out! Those conversations will help him clarify his thoughts in words, and that’s what writers do. Even if you don’t transcribe what he’s saying, I imagine your conversations will be helpful to him. And every kid deserves a parent who is interested in what he or she has to say! I doubt that I’m telling you anything that you don’t already know. You have good instincts about what your kids need–keep following those instincts! I found your blog just today and so happy I did! Your homeschooling ideas are simply brilliant. That dictation can facilitate the narrative skills in a child is an eye opener! I have a 5 year old girl and we do a letter-a-day project. She writes a one-page letter to any body she feels like – that day and snail-mails it to the person. I have noticed phenomenal improvement in her narrative skills over a period of time.. Earlier today, I also read an old post on your blog (I think, dating back to Feb 2009) about child-led learning and linked it to my today’s blog post that talks about similar philosophy. It’s so nice to meet you, Rashmie. I loved reading your post about Pari’s crown, and also the one about her being your travel agent! And what a meaningful letter-writing project you have going! It’s so fantastic to see the energy kids have for projects that engage them. And for me, to hear from a reader from India is a real treat. It’s amazing that like-minded people can reach hands across the world these days. Thank you for linking me to your blog, and for taking the time to say hello–all the way from India! You’ve demonstrated so many good things that dictation facilitates. I really enjoyed reading about the collaborative effort between you and T. It’s a model of learning that is what makes homeschooling unique, as it would be unfeasible for a classroom teacher to interact in such a way with all of his/her students. What I like best is that you are facilitating learning. It’s not a top-down, hierarchical relationship, that is prevalent in school, but a comfortable discourse in which a lot of information may be gathered by T. The information he has gained through your exchange is immense. And–he wasn’t passive to receiving it. He didn’t have to sit there while you lectured on the various points of writing and grammar. Instead he was an active participant. Of course he would be more likely to be interested to hear what you have to say because it was his material, something he knew and cared about, that would make learning something related to it desirable. I think that’s the big secret about dictation: it’s never been promoted as a useful, long-term tool for learning to write simply because it isn’t feasible in a classroom. But it has such potential! Thanks for your never-failing support and insight, Kristin!